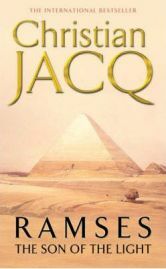 Ramses: The Son of the Light by Christian Jacq was lent to me by a friend who assured me I would like it – we swap a lot of books and have many similar tastes so I thought she was probably right, but it wasn’t the kind of book I was likely to choose for myself. Telling the story of one of ancient Egypt’s most famous pharaohs, Ramses: The Son of the Light is the first novel in a series of five. Opening when Ramses is only fourteen, Son of the Light follows the future leader through his teens as his father, the pharaoh Seti, subtly trains him for his future role – although Ramses older brother Shanaar is thought to be the heir, Seti chooses Ramses. I know little about ancient Egypt, only what the average layperson would know – some place names, some people, and a general image of the civilization based on the monuments which survive today.